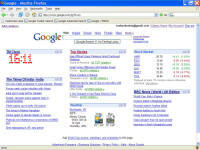 The gadget adds a large digital time display to the personalized Google homepage. Additional features include a 12 or 24 hour display, an optional display of seconds, and the ability to view the time in any other timezone. Click the image or button below to add the time gadget to your custom Google home page. The top of the page is the standard Google search capability. The gadgets of interest to me include my own contribution, several news sources, the local weather, and a few stocks.